Good nutrition is an important aspect of all our centres, so it’s no wonder that cooks are a vital part of the Guardian family. Recently, we held our QLD Educator Awards night where we awarded some true standouts at our centres. One such standout was Natasha Merckel, the cook at Guardian Early Learning Centre – Clayfield who was awarded QLD Cook of the Year. Natasha has been with the centre almost since the beginning and has been integral in making the centre what it is today. We take two minutes with Natasha to find out more about her history, what she loves about her job and where she would like to travel to next (hint: this country also loves its food). I immigrated to Sydney from South Africa 19 years ago and worked in the Finance industry at one of the ‘Big Four’ banks in Superannuation and investment banking and later for a multinational company, also in wealth creation and wealth protection. Here I worked in the customer service division as a Product Specialist and training new customer representatives in good customer service and product knowledge. A little later we started a family and I took the opportunity to raise our three boys. Our family made the move to country NSW in support of my husband’s career. In the years that I spent away from the workforce I actively volunteered in our school, church and general community. After making the decision to move to beautiful Queensland I decided that the time had come for me to join the paid workforce. I felt a sense of freedom to reinvent myself and follow the advice of my Dad: “You are the author of your happiness” and I decided to do what I love… Cooking! I accepted a position at a primary school to overhaul their tuckshop and introduce the Smart Choices model to the school community. I loved this role and learnt that I do love creating menus and recipes, I love working in an environment with children and I love to be part of teaching a life skill to little ones. Most importantly, I was learning. I then started working in Early Childhood and my passion grew, doing short courses in nutrition, I was hooked. I now find myself caring for a beautifully diverse group of families. How long have you been at Clayfield for? I started at Clayfield five months ago – two weeks after the grand opening. What do you love about Clayfield ELC? I love my work space. It’s comfortable and I get to greet and welcome every child and family in the morning. The children visit and have wonderful conversations with me. I am part of a team that support each other. I’m very fortunate to be surrounded by good people. Seeing the delight on the children’s faces when they are enjoying the meal and having a positive food experience. 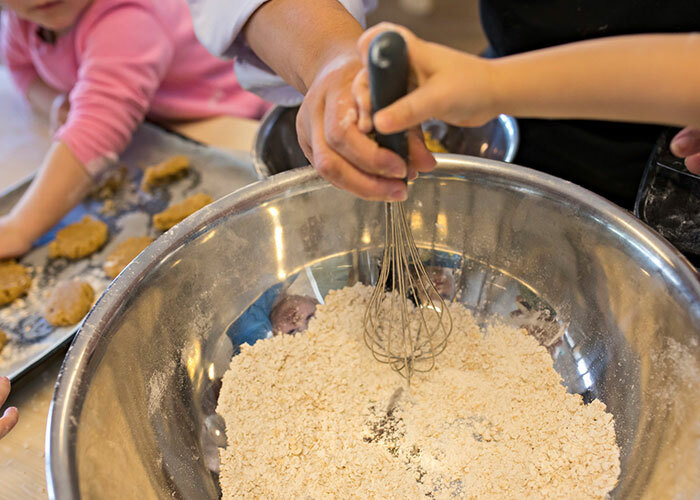 What’s one of your favourite things to cook for the children? I love to cook curry and judging by the clean bowls, they love eating curry! I feel that we need to establish good food habits at an early age and create positive food experiences helps to foster a good relationship with food. The relationship between nutrition, health and learning is undeniably strong. As our children experience periods of rapid growth, good nutrition gives them the energy to do this. Part of good nutrition is being exposed to different textures and also assisting with oral health and motor skills which are important for speech development. What was your most loved food as a child? My favourite meal was a layer of plain spaghetti with a huge dollop of beef Bolognese sauce, sprinkled with grated cheddar cheese, topped with a slice of fresh tomato and seasoned with salt and cracked black pepper. I love making music – I play the flute and piano. Where’s one place in the world you’d love to travel to and why? Italy. Their food philosophy is similar to mine. Fresh quality produce packed with flavour and sharing the dining experience with family and friends. They also have a rich history in art and music. To find out more about this wonderful early learning centre in Brisbane, and to meet the team (including Natasha!) we invite you to book a tour here. We look forward to welcoming you to our centre.